SUMMARY: After a series of encounters with the law, a young man yearns for a better life and escapes his past as he heads to New York City where his pursuit of happiness and success sends him on a series of well-intentioned misadventures that lead him into the dark side of the criminal underworld and revenge. 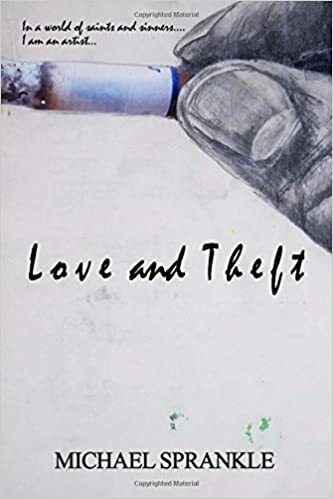 A marriage of real events and fiction, Love and Theft pulls from the author’s personal experience to create a man whose life path is no more his own fault than the color of his hair. THE BACK STORY: Although a work of fiction, many parts of this book are based on fact. I’ve had some life! WHY THIS TITLE? : I chose Love & Theft for the title because everyone needs love, and we have to steal a heart in order to get it. And once you have stolen a heart, stealing anything else does not compare. WHY SOMEONE WOULD WANT TO READ IT: All the reviews I have gotten on this book are 5 star reviews, so I feel that it must be enjoyable. I have put many things inside each chapter that almost anyone can relate to on some level. Michael Sprankle’s writing is imaginative Genius that is an engaging and wild ride. Each page is intriguing, entertaining and oh so cool. Take One Republic’s “Counting Stars” mix with a dash of Kerouac, put in some Robert Rodriguez direction, a swirl of Iconic Characters that serendipitously appear like seeing a fine magic act, then add in depth facts that leave you hoping the ride will never end. The main character is humorous, complex, intriguing and very resourceful. One can only ask, “what is next?” as we leap from intertwining events laden with engrossing detail. This read is clever and leaves you wanting more. …..”Everything that kills me, makes me feel alive,” is ringing in my ears as I read the last page, hoping that there will be more to savor from this extremely talented author. Bravo!!! Reading Love and Theft is like finding the perfect snow crusted hill with a brand new Flexible Flyer in your hands. Hard to stop before you get to the end; and once you do, you want to do it again. Love & Theft is a charming second novel full of wit and current events. In this gem, Sprankle gives us a step-by-step account of how he comes to know his inner ‘demons’ and his continuous struggle between good and bad. It’s a quest of revenge and redemption, and a fast paced trip through hell and back. The constant references to art as well as his interpretation of The Wizard of Oz will make you look at life in an entirely different way. This years sleeper, Love & Theft is a must read by all. AUTHOR PROFILE: Michael Sprankle is a graduate of Penn State University with a BA in film. He has worked in the technology area for the past 25 years, as well as being a bit-writer for major motion pictures and television shows, and has worked for some of the largest studios in Hollywood. WHERE TO BUY IT: Amazon, Barnes & Noble, TouchPoint Press. Sounds interesting, writer with a varied background. Good luck! Actually, the post featuring your book ran the week of Oct. 25. I sent an e-mail out a week before, and I apologize if it somehow didn’t get to you. The post is below, although it looks a little different copied than it actually does on the page (the formatting gets a little funky when I copy it). Here’s the good news, though — the post went out to all our followers, who now number over 1,700. And if you’d like to spread the word by social media, anyone who goes to our Author page and clicks on your name can see the post in its entirety. I hope you get some sales from it.